A new luxury 5 Star Hotel with 192 bedrooms and 9 suites. Located with view to the sea or golf - a special Health Spa with latest treatments - three pools and three hectares of garden - and more. Online Discount. Opened in 2005 the 5 Star The Lake Resort Hotel & Spa faces south and is situated at the mouth to the Vilamoura Marina in the Algarve. The Resort has been carefully created as a structure to join pleasing architecture and an interior that reflects some of the immense past Moorish culture of Portugal. From the moment you enter the lobby you are aware of its calming charm. The aim is for guests to experience an atmosphere in which there wellbeing is paramount. The Hotel has 192 guest bedrooms with 9 suites. Connecting rooms are available. Within the grounds there are a 95 privately owned apartments some of which are also available for rent. Each bedroom is comfortable spacious with individually air-conditioning, a safe, mini-bar, work area, Internet and Voice Mail, satellite and Pay Video channels. The décor for the suites are oriental in style and quietly blended with western comforts. The other guest rooms are tastefully decorated with a 'Mediterranean' theme. The Resort has a spacious outside area which separates it from the beach. The pool and terracing segment boarders a lake which leads back into the Marina. There are three generous outdoor pools, one heated, and one which has been designed as a semi-beach with the surround and the pool bottom covered with sand. In between these is located a open style bar which also serves snacks. On the lake there floats the 'Marenostrum' restaurant which specializes in fresh fish. 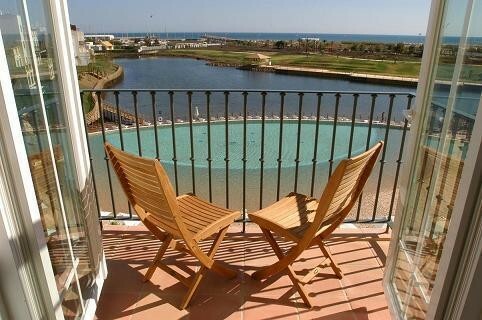 In the 3 hectares of garden there is a multi-purpose court and an open air terraced event area. For dinning there is the choice of either the 'Fusion' restaurant or the 'Gustatio'. The former has a menu that combines the cuisine of China, Japan, Thailand and Vietnam, whilst, the later offers what is known as a Mediterranean cuisine. A separate area off the foyer and named the 'Jaipur' is reserved for the partaking of Indian tea. For young guests there is the supervised 'Koala Club' and its covered games area. A games room offers billiards and table tennis. A library area is combined with a small public business centre. A spacious underground parking area is provided for guests. As the Resort is surrounded by golf courses there is a Courtesy Bus for guests to take players to their game. Finally, there is the jewel in the crown of the Resort - the 'Blue & Green Spas'. The Spa, by Blue & Green, is original in many ways for its conceptual ideas - 'a place where the body and mind can find a perfect balance through Five Continents and Five Senses'. The main segment is the 'Blue Spa' which acts as reception and has generous heated pools, five individual treatment rooms mainly associated with water. The separate 'Green Spa' has a further five rooms to provide other various forms of specialized body treatment. Thoughtfully, the corridor connecting both areas is devoted to guest rooms for clients of the Spa, thus making it both convenient and semi-private. Finally, there is the Lake Beauty Centre which offers numerous different face and body treatments. This spacious air-conditioned room includes a balcony with views of Falesia beach. Each has a flat-screen TV, and a private bathroom with free toiletries. This spacious air-conditioned room includes a balcony with panoramic views of Falesia beach and the resort's private lake. Each has a flat-screen TV, and a private bathroom with free toiletries. This spacious air-conditioned room includes a balcony with views of the resort's gardens. Each has a flat-screen TV, and a private bathroom with free toiletries.